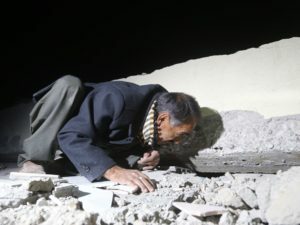 Iraqis search for the trapped citizens in collapsed buildings after a 7.3-magnitude earthquake hit northern Iraq in Derbendihan district of Sulaymaniyah, Iraq on Sunday. A magnitude 7.3 earthquake that struck northern Iraq and parts of Iran has killed more than 330 people in both countries and injured more than 3,000, according to officials. It is the strongest quake to hit the region in years. Most of the reports of dead and injured came from Iran, with an official there quoted by the semi-official ISNA news agency as saying 328 are dead and 2,500 hurt. The Kurdistan region Ministry of Health says eight people were killed in Iraq, seven in Kurdistan and an eighth in Diyala province. The health ministry said 535 had been injured. Reuters, quoting state media, says Kermanshah is the hardest-hit province in Iran and that more than 140 victims come from a single town there — Sarpol-e Zahab, located about 10 miles from the Iraq border. The main hospital in the town was reported to have been heavily damaged. Iran’s seismological center says it has recorded about 118 aftershocks. The head of Iran’s Red Crescent said more than 70,000 people were in need of emergency shelter, according to Reuters. The Associated Press quoting Iran’s state-run IRNA news agency said rescue work was continuing overnight and would intensify come daybreak. 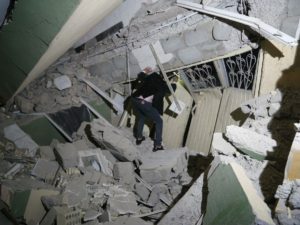 AP quoted the semi-official ILNA news agency as saying at least 14 provinces in Iran had been affected by the earthquake. Social media from Iran showed signs of damage — broken glass and collapsed structures. She says that engineers were checking for damage to the Darbandikhan dam and have informed people living near the river to leave. Officials at the larger Mosul dam said there were no immediate signs of damage. The U.S. Geological Survey said the epicenter of the quake was located about 150 miles northeast of Baghdad and 450 miles west of Tehran. Tremors could be felt in both capitals, reports said. “The night has made it difficult for helicopters to fly to the affected areas and some roads are also cut off… we are worried about remote villages,” Iranian Interior Minister Abdolreza Rahmani Fazli said in an interview on state television, according to Reuters.